Love it when you wear red ,also love the Scarf ,amazing Outfit! carinissima la maxi sciarpa, bellissimi colori!! baci buon weekend!! Liilly you are fantastic! Bellisima, NIce red lips on you, I liked the bag and all rings! Have a fun friday mi dear friend! Mi piace tantissimo la sciarpa usata a mantella....speriamo solo il tempo ci conceda di giocare un pochino con gli outfits! Buon week end!!!! La mini bag è bellissima Lilly poi il rosso..lo adoro per questa ss 2015. You look beautiful Lilli <3 Love this outfit from top to toe, the blanket cape, the bag, the rings...everything is wonderful!!! We are having some real time spring days here now, so no more woollens! Have a great weekend sweetie!! Lilli il rosso è proprio il tuo colore, ti sta benissimo! Quella mantella deve essere molto calda. Ma cosa ci metti in quella borsetta??? (curiosità da uomo). You look all wrapped up and comfy Lilli! Splendido look, mi piace molto la maxi sciarpa! Ahah! Portamonete, chiavi, specchietto, rossetto, fazzolettini e telefono!^^' Buon weekend anche a te! You look so chic and cozy and I really like this combination of colors on you Lilli! I hope you have a bright sunshiney weekend ahead of you! 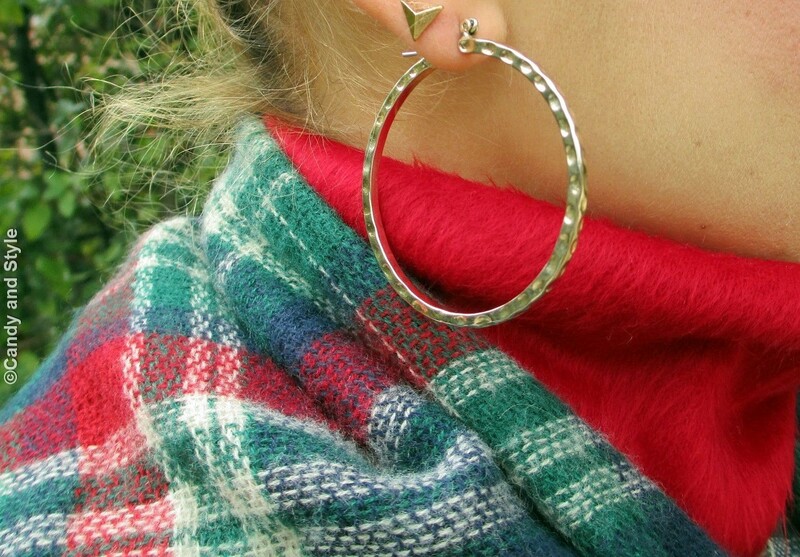 How cool and chic is that tartan scarf? You look absolutely lovely as always Lilli! And girl, I swear you have the most gorgeous red lipsticks! You look soooo beautiful Lilli! che bella la tua maxi sciarpa! Avevo già visto un'anteprima su FB.... è bellissimo questo look Lilli, mi piace ogni singolo dettaglio e lo indosserei subito anch'io!!!! Very nice and cosy outfit! I like the red theme that runs through it. Tastefully styled as always! Hello sweet Lilli!!Wow! !You look so preety dear!! I really like your outfit!What a beautiful scarf!! Adoro la sciarpa indossata a mo' di mantella Lilli, in più è l'ideale per le mezze stagioni! Bellissimi gli stivaletti e soprattutto adoro l'acconciatura che hai scelto, sta benissimo con il look! Buon week-end cara!! such a scarf i a great garment for this season. It´s easy to wear it, if the weather changes. And l love the tartan pattern. In combination with red or green this pattern looks very nice. And you also look very nice. The little red bag i one of my favorite pieces in your wardrobe. Ravishing in red! Love all the red tones in this, especially the lip colour Lilli. You werk it so well. It's pretty chilly today where I am and I would not mind wrapping myself in that lovely plaid wrap. Oh Lilli qui in Sicilia c'è un vento pazzesco.. Mi divertirei con la tua sciarpa!! Me la presti giusto finché arriva il caldo? ♥ Sei bellissima! Love your Mango scarf. The colour combination is my favourite - blue, green and red, in that order. It's good that you can use your scarf as a shawl to keep you warm and look so chic. Happy Friday! Lilli, you look magnificent! That tartan wrap looks gorgeous on you. Red is your power color. Love the lips, crossbody bag an those jeans & boots just top it off. Really great look! carinissimo questo look...sei sempre bellissima! il rossetto rosso ti sta bennissimo! I love scarfs used as blankets, so comfy! lili, your blog is looking amazing! You look fabulous dear friend in the tartan - love the outfit and all your photos. Hi Lilli!! You look fabulous in your outfit, love everything about it, but the scarf shawl is gorgeous! Also love your makeup and hairstyle, beautiful!!! La maxi sciarpa come poncho è un'idea meravigliosa!!! Che bello questo sciarpone, splendidi colori!